It’s that time of the year again. You know, the season when the Daily Mail and other newspapers of that ilk start getting silly ideas like the one about schoolkids having to wear goggles while playing the age-old Autumnal playground game of conkers (actually, the Health and Safety Executive themselves debunked that one as a myth quite some time ago). But there are some people who do actually take the game of conkers very seriously, and not from a Daily Mail elf n safety gorn maaad-type of perspective either. Conkers is actually a very competitive game. Seriously. And I don’t mean competitive in the way of those endless, best-of-a-million bouts with a treasured baked and vinegar-soaked winning conker in a chilly school playground that many of us will recall from childhood either. There are official rules and even an annual World Conker Championships, held every October in Northamptonshire. Cheating is quite severely frowned upon in the world of the conkers player – in fact, this BBC report from 2005 (although it does repeat the goggles story) tells of how ex-Monty Python star, actor and world traveller Michael Palin was disqualified from a conker tournament in 1993 for using the traditional schoolboy ‘strengthening’ method of soaking his competition conker in vinegar! I spotted this rather shiny specimen (see photo above) earlier this week, lying lonely underneath an unhappy-looking horse chestnut tree in Marble Hill Park (near Twickenham) during one of my regular photographic rambles in the area. There certainly seem to be fewer conkers than normal this year, although their numbers actually appear to have been in decline for several years now – in 2008, the WCC had to send an emergency call out to other parts of the country for enough conkers to allow the championships to take place. The problem appears to be twofold: an unpleasant-sounding disease called Bleeding Canker, which is rapidly spreading throughout the UK’s population of almost half a million conker trees, as well as the ominous horse chestnut leaf miner moth, which has been devastating British trees for almost a decade. It seems that, in combination, these are causing real problems for many horse chestnuts in Britain’s parks and public spaces, although research is being carried out to find some way to prevent things from getting any worse. 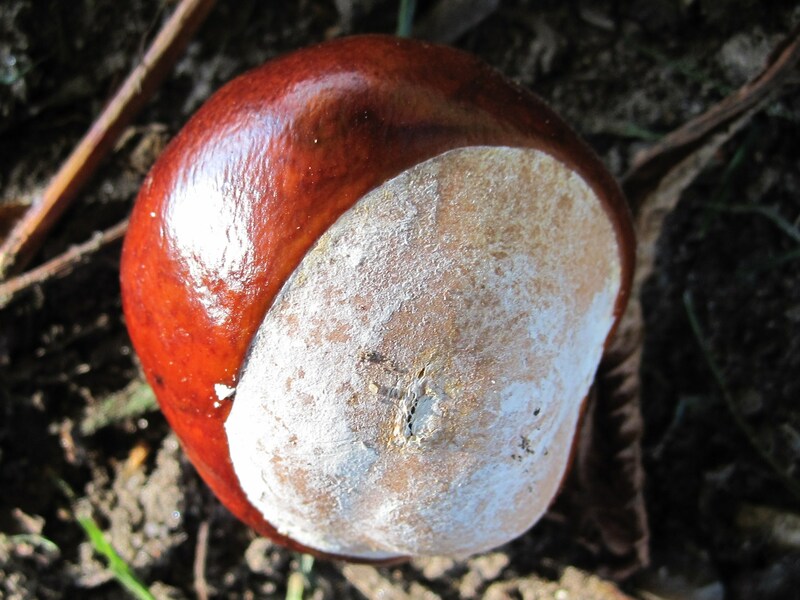 It saddens me to see the lack of conkers this year, and to see the horse chestnut trees in my local area suffering so visibly, particularly from the unwanted ministrations of the leaf miner moth. The horse chestnut is a much-loved tree in this country, often one of the first to break Winter’s spell with its cheerful ‘candle’-shaped blossoms in early Spring, and, of course, is the provider of generations of conkers for generations of small boys to hit each other with (and for cats to chase across polished wooden floors!). These trees may have only been here for around four hundred years (a mere blip in time, compared to some of Britain’s native tree species), but it would be a real shame to lose them to pests and disease now, at a time in our history when we need all the trees we can get.